Most of us are familiar with rusty iron: metal that has a dark red-brown scale that falls off an object, ultimately weakening it. Although we usually attribute rusting exclusively to iron, this process occurs with many materials. The more formal term for rusting is corrosion. 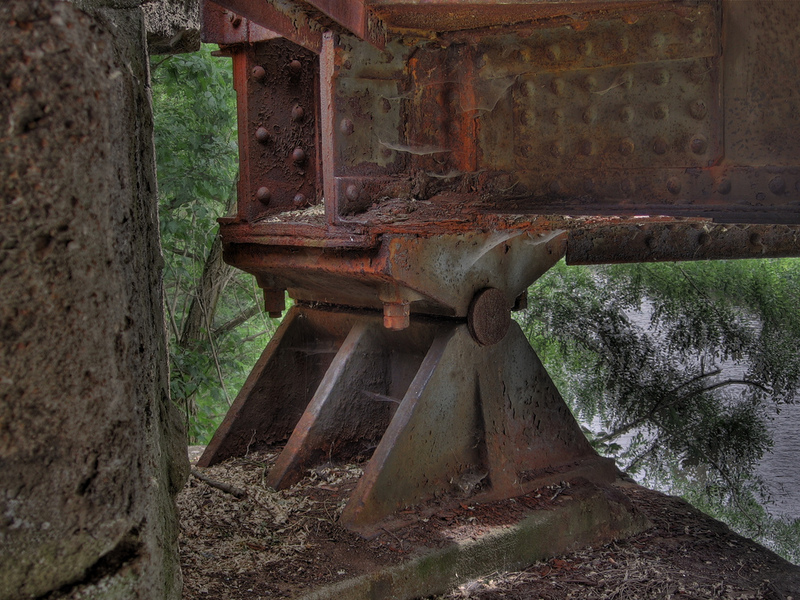 These support beams on a bridge are obviously rusted. If the rusting becomes too bad, it will compromise the integrity of the bridge, requiring replace- ment. Corrosion is defined as the disintegration of a material due to chemical reactions with other substances in the environment. In many cases, oxygen in the air causes the disintegration. Corrosion is not uniformly destructive. Although the corrosion of iron is generally considered bad, the corrosion of aluminum and copper forms a protective barrier on the surface of the metal, protecting it from further reaction with the environment. Having said that, it has been estimated that as much as 5% of expenditures in the United States apply to fixing problems caused by corrosion. The replacement of structures built with iron, steel, aluminum, and concrete must be performed regularly to keep these structures safe. As an example of what might happen, consider the story of the Silver Bridge on US Interstate 35, connecting West Virginia and Ohio. On December 15, 1967, the 39-year-old bridge collapsed, killing 46 people. The ultimate cause of the collapse was determined to be corrosion of a suspension chain on the Ohio side of the bridge. Corrosion is an example of the type of chemical reaction discussed in this chapter. Although we usually think of corrosion as bad, the reaction it typifies can actually be put to good use. One important type of chemical reaction is the oxidation-reduction reaction, also known as the redox reaction. Although we introduced redox reactions in Chapter 4 “Chemical Reactions and Equations”, Section 4.6 “Oxidation-Reduction Reactions”, it is worth reviewing some basic concepts. Introduction to Oxidation and Reduction by Jessie A. Key is licensed under a Creative Commons Attribution-NonCommercial-ShareAlike 4.0 International License, except where otherwise noted.